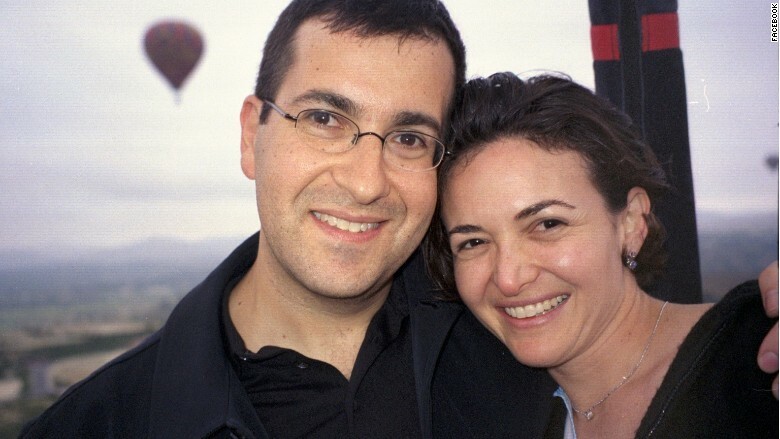 For all the kind words that have been said about Dave Goldberg since his death on Friday, none match how Sheryl Sandberg described her love for him. Goldberg is a major character in Sandberg's bestselling book "Lean In." She described her late husband as a model of modern fatherhood, and a strong advocate for her and her career. In her book, Sandberg recounted that after she was divorced at 25, she felt that she couldn't overcome the "scarlet letter D." But Goldberg helped her realize "that the 'good ones' were not all taken." She posted a photo on Facebook (FB) of herself and Goldberg on March 5, noting that they had met over 15 years ago "and we immediately became the best of friends." "He was the first person to show me the internet, the kind of friend who shows up to help you move apartments (read: bad pre-Dave breakup), and always made me feel like I was home no matter where I was," Sandberg wrote. "He is a 50/50 partner at home and a dedicated father (although not sure my kids needed to learn poker at ages 4 and 6)." Sheryl Sandberg called her late husband Dave Goldberg her best friend, and she said their marriage was the best decision she ever made. Sandberg has said Goldberg was an "exceptionally devoted dad" from day one, when Sandberg was unable to walk after a difficult pregnancy. "Dave had to get up when the baby cried, bring him to be fed, change him, and then get him back to sleep," she wrote. "Dave taught me how to change a diaper when our son was eight days old." Goldberg insisted that his wife take a demanding executive role at Facebook when their daughter was just six months old, and he pushed her to negotiate her salary higher, even when she thought Mark Zuckerberg's offer was "fair." When Sandberg was working late nights, Goldberg took on more responsibility with their children. Though most men make more money than their wives, Sandberg said her billionaire status never fazed Goldberg. "People frequently pull me aside to ask sympathetically, 'How is Dave? Is he okay with, you know, all your [whispering] success?' Dave is far more self-confident than I am, and given his own professional success, these comments are easy for him to brush off." Still, their marriage wasn't always easy, Sandberg noted in "Lean In." As the head of Yahoo (YHOO) Music, Goldberg had a hellish commute, flying back and forth several times a week between his job in Los Angeles and their home in the San Francisco Bay Area. "Even though he was making an exhausting effort to be with me and our baby, he was still gone a lot," Sandberg recalled. "The great majority of child care fell to me. The division of labor felt uneven and strained our marriage." She said "balancing two careers and two cities was not adding up to one happy family." So Goldberg left his job at Yahoo, took on a new role as CEO of SurveyMonkey and moved the company from Portland to San Francisco. Though they tried to achieve a "fifty-fifty" split in chores and parenting, Sandberg noted that didn't mean they were always doing exactly half all the time. "Dave and I have had our share of bumps on our path to achieving a roughly fifty-fifty split," she wrote. "After a lot of effort and seemingly endless discussion, we are partners not just in what we do, but in who is in charge. Each of us makes sure that things that need to get done do indeed get done. We are never at fifty-fifty at any given moment ... but we allow the pendulum to swing back and forth between us." Despite the couple's feminism, Sandberg said the division of household chores had been "pretty traditional." "Dave pays bills, handles our finances, provides tech support. I schedule the kids' activities, make sure there is food in the fridge, plan the birthday parties. ... I would rather plan a Dora the Explorer party than pay an insurance bill, and since Dave feels the exact opposite, this arrangement works for us." Sandberg often spoke about her husband with humor. "My enthusiasm for reorganizing my closet continually baffles Dave," she said. "Dave hates training of any kind, and the human resources team at Yahoo had to force him to attend a two-day session," she mentioned. "Our children are still young and go to sleep early, which gives me plenty of time to work at night and even to watch what Dave considers to be truly bad TV," she wrote. "He's the best partner I could imagine -- even though he's wrong about my TV shows being bad." In the afterward of her book, Sandberg called Goldberg "my best friend, closest advisor, dedicated coparent, and the love of my life. ... He supported me every step of the way, as he always does, with patience, great insight, humor and love." In that March 5 Facebook post, Sandberg noted that the most important career decision a woman can make is whether she takes on a life partner and choosing that person. "The best decision I ever made was to marry Dave," she said.